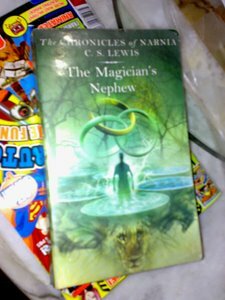 - The book was the sixth book published in The Chronicles of Narnia series, but is the first in the chronology of the Narnia novels' fictional universe. The thing about this book is that it's a children's book that adults will surely love. The universe created by C. S. Lewis is so stunning that readers kept coming back to it. This is where all the Narnian adventure begins. "Narnia ... where Talking Beasts walk ... where a witch waits ... where a new world is about to be born. "On a daring quest to save a life, two friends are hurled into another world, where an evil sorceress seeks to enslave them. But then the lion Aslan's song weaves itself into the fabric of a new land, a land that will be known as Narnia. And in Narnia, all things are possible ..."
Digory and Polly are tricked by Digory's Uncle Andrew, a bumbling yet malevolent self-taught magician, to become part of an experiment. When they touch Uncle Andrew's magic rings however, they are sent into the Woods between the Worlds where they can enter many other worlds through the pools that scatters around the area. There they discover magical beings that are only known as myth in the world we live in. But lo, The Queen has followed them to London and brings havoc and discord wherever she goes. Digory and Polly must do something. While trying to save London from the evil Queen Jadis, they are unfortunately brought back to Narnia.